I stumbled upon this little vintage tray. As you can see there's a picture of a cat and a dog on it, playing with a ball of yarn. I just love the atmosphere of this picture. It's nostalgic and simple. It reminds me of simpler times! I even like that the tray has some dents in it. It makes it even more special. I paid 1,75 for it. 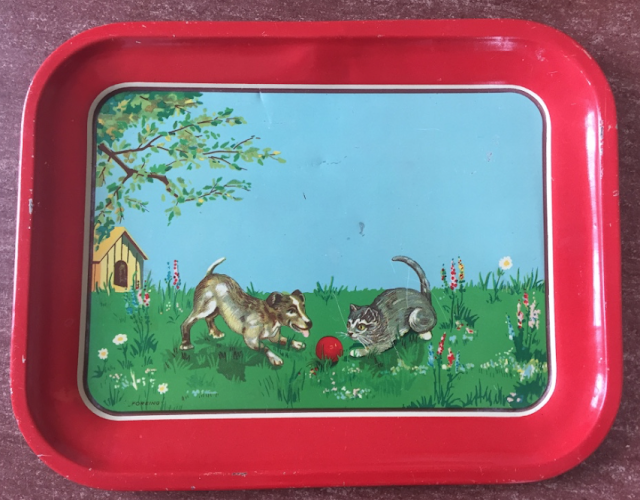 How do you like this vintage tray? Hi! Happy WW! I found you over at Oh Heartsie Girl! I just love your tray! It's so cute and whimsical, but doesn't have the creepy eyes that some older things have. LOL Where are you going to display it? I can't believe the deal you got on it, too!